Its composition: 70% tannat, 20% cabernet franc, 10% cabernet sauvignon. Tannat, with its firm, tannic grip and dark, purple color, predominates in this wine. I opened it yesterday right before a Korean meal of rice, kimchi, pollack roe, spinach cakes, fish–pretty much a wine pairing nightmare. I knew I only had a few minutes to enjoy the wine unsullied by the sledgehammer tastes of red pepper, shrimp paste, vinegar, roe… I opened the bottle of Ilarria, poured some into a glass, gave it a long, hard swirl, and brought the globe to my nose. Again, cherry. Damn it. But more, too. Was that… oregano? Blackberry, maybe. I was really grasping at straws here. The taste: straw! Earth. I tasted the sweet, bitter, slimy taste of persimmon. Some herbs. The tannins made themselves known, though they weren’t at all unwelcome. Musky, meaty–the wine definitely reminded me of the Japanese concept of umami (read this interesting article on umami here that I had linked to a few posts back)… salty, sweet, savory. Mostly savory. Something meat-like. Gamy, even. Then, I started dinner. I don’t care how self-reliant, fierce, and proud the Basques are, but their wine was no match for my native cuisine. Today, I had leftover “gourmet” pizza from Heirloom for dinner. This pizza had some strong mozzarella, strong tomato, strong sauce, and strong oregano and thyme. Perfect for the wine. I poured myself a liberal glass, had a bite of pizza, washed it down with wine–ah. A wonderful match! The herb profile of the wine was a superb complement to that of the pizza. The pizza brought out a latent acidity I had not previously noticed on the first tasting. Very, very good. I’ve been wondering about which wine, if any, matches with Korean food. I love off-dry riesling with Thai or some Chinese, but Korean food is not especially known for being sweet. I love dry riesling or a nice bubbly with Japanese–sushi or sashimi–but the thought of champagne with bean paste soup makes me want to throw up. Traditionally, Koreans have had soju or beer with their meals, but could we possibly reconcile wine with kimchi? The only one pairing I know goes well is zinfandel with kalbi jim (err… braised shortribs). The shortribs are braised in a sweet broth, complete with mushrooms, carrots, potato, and radish. It’s a hearty, filling dish, and one that goes very well with the slight sweetness and acidity of zin. Any thoughts, my Korean brethren? I think pairing wine with a lot of asian food can be tough. I just spent a few weeks in Vietnam visiting my partner’s family and it was difficult to match anything with the local food (which was awesome in its own right!). It’s weird that the French colonization brought all this french cuisine influence and wine and yet absolutely no fusion cuisine that matches well with french wine :). I know Korean is pretty different from Vietnamese, but there is a fusion-y vietnamese place in San Francisco called Slanted Door that matches their food with Austrian Gruners and German Rieslings. I went there and thought it was a good combination. But, again, I doubt they would match with ‘authentic’ Vietnamese food. 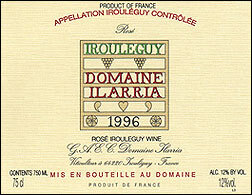 Oh, and btw that Irouleguy sounds awesome – I’ll have to find some somewhere. I’m doing a bit of research on pairing wines and Korean food. Vinho Verde, a Portugese wine came up on a google search. Zins and Australian Shirazs were also recommended. Beers were far more recommended. NPR recommends a pale book with KBBQ. Lagunitas Czech style Pilsner and an assortment of Belgian beers were also mentioned. As far as the Slanted Door goes, they were one of the first places I’d seen that featured Chinons in abundance. That and the Vinho Verde makes me think to look at other European reds from either Greece, Hungary, Lebanon, Alsace, and Austria. The key is low alcohol (which can be at ends with Zin) and present acid. Too bad the Irouleguy didn’t work out, I saw it pop up adm was hoping.